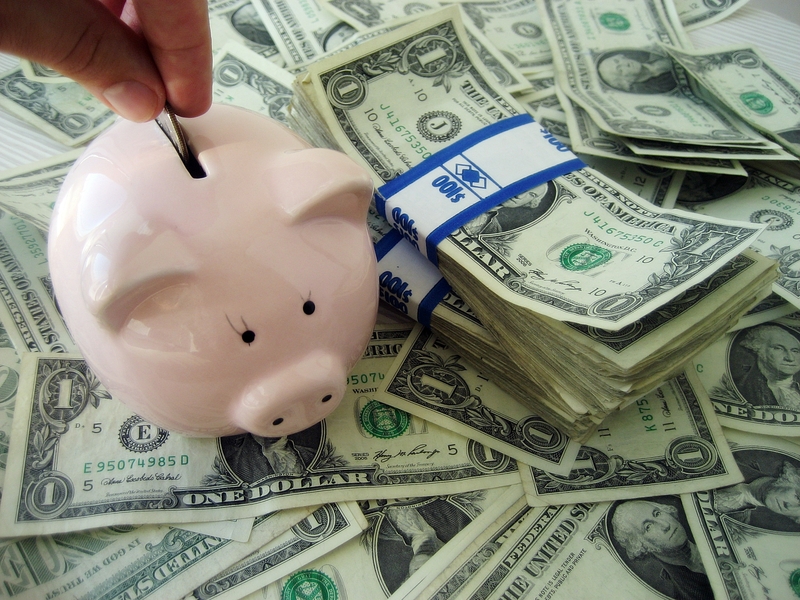 Investment Directions: So What Should I Do With My Money? We are underweight U.S. stocks. After its June policy meeting, the Fed signaled that it was getting close to raising short-term interest rates on improving economic conditions and promised to move gradually. Yet turmoil surrounding Greece and China has brought more uncertainty to the global economic outlook, which could give the Fed some pause. To begin with, there is reason to proceed with caution. The latest U.S. readings on jobs and the housing market point to an economic reacceleration in the second half, but soft spots remain. 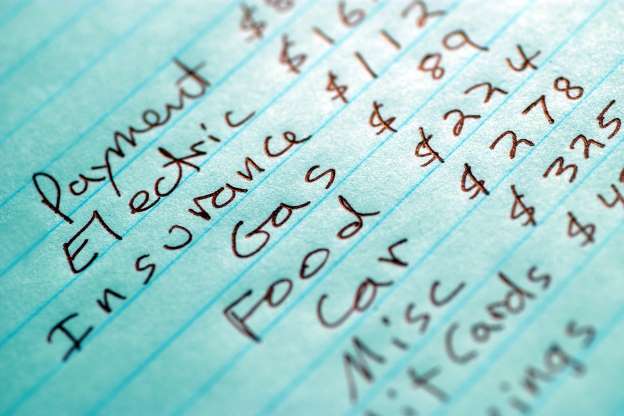 Measures such as retail sales and durable goods continue to show weakness. 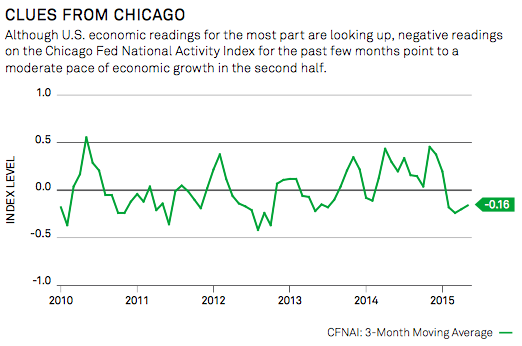 And, the Chicago Fed National Activity Index (CFNAI), a good leading indicator for the country’s overall economic health, has inched higher but is still running below trend (see the chart below). Given that valuations of U.S. stocks are relatively pricey, we tend to search abroad for better value and opportunities. But we think U.S. stocks have further upside potential, keeping in mind that mergers and acquisitions just hit a new high in the second quarter. It is still early in the second-quarter earnings season, but with estimates having already been lowered, the U.S. economy recovering and the dollar having stabilized, companies should have an easier time beating estimates this time around. Many measures of U.S. economic activity have improved since the slowdown early in the year. While weakness lingers in some areas, the U.S. economy looks set to regain speed. Selectivity is important in the U.S. market, where value will vary by sector and individual company. Consider blending opportunities for core market exposure with high- conviction active solutions that focus on finding value in the market. We hold an overweight to eurozone equities. Uncertainty surrounding Greece and its membership in the euro area will keep risk premiums and volatility elevated; however, we think fallout from the Greek drama will remain contained and short- lived (see Hot Topic on page 7). In fact, with economic data coming roughly in line with forecasts and profit expectations firming, any further volatility in eurozone equities could present an opportunity. This is especially true since the European Central Bank (ECB) is expanding its balance sheet and is poised to provide further monetary accommodation if needed. Any continued euro weakness associated with these events will likely give an additional kick to earnings as profits are repatriated. That said, investors should consider hedging their currency exposure to eurozone equities to avoid returns being eroded by euro weakness. We are overweight Japanese stocks. Somewhat sheltered from this year’s financial market roller coaster ride, Japanese equities have not only been an island of relative calm and tranquility (see the chart below) but also an area of strong outperformance. Japan’s economy, while certainly not a locomotive, has managed to pull out of a shallow and brief recession and is beginning to show signs of benefiting from a weaker yen. Moreover, Japanese companies have come a long way in improving profitability, and they are also lifting dividends and share buybacks to boost return on equity. Despite outpacing the rest of the developed world so far this year, Japan remains inexpensive based on price-to-book and forward price-to-earnings ratios. We have a neutral view on developed Asia ex-Japan equities. A setback in Chinese stocks, slower commodities demand growth and negative earnings revisions have weighed on the region’s equity markets this year. However, after the summer selloffs, we think Asia ex-Japan equities warrant a closer look. Take Hong Kong, the Hang Seng Index has very recently regained some lost ground, but not before it fell to the cheapest levels versus the MSCI World Index since September 2003. Also of note are the above-average dividend yields, with Australia yielding north of 4.5%. Earnings growth and valuations of European and Japanese companies are more compelling than for U.S. companies. But renewed strength in the greenback could erode returns in international markets for U.S. dollar- based investors, boosting the allure of currency hedged exposure. Consider using an active manager with strong stock selection expertise or be selective with index-based exposures. We hold a benchmark weight to emerging markets. Since topping out at the end of April, emerging markets have entered another correction phase, and the selloff has been quite indiscriminate. While markets have stabilized somewhat very recently, emerging Asia has clearly dominated price action since the end of June. In addition to China’s equity market woes, Latin America has underperformed again so far this year and Eastern Europe sharply declined since mid-May. However, we still prefer emerging Asia. Countries in emerging Asia have greater scope for monetary accommodation and market reforms, will likely experience better growth (though not great), should benefit most from lower oil prices and have increasingly competitive currencies. We have a neutral weight in China with a preference for H-shares. Chinese stocks tumbled the most in nearly six years in early July after a series of measures (and some quick backtracking) paradoxically aimed at stabilizing financial market conditions backfired. 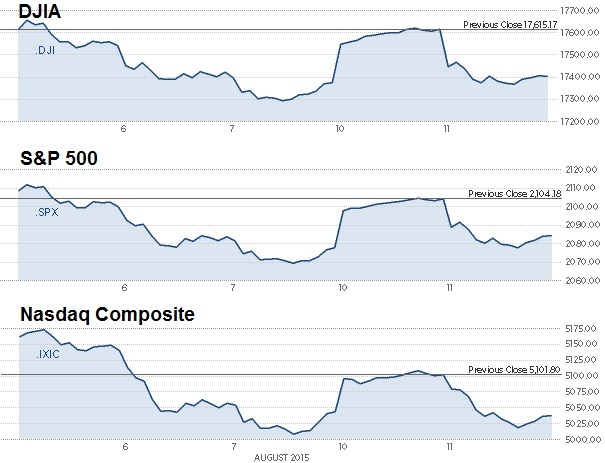 While the slide has paused for now, we expect more volatility, particularly in the onshore exchanges. After downgrading China to neutral in June, we will hold off from chasing newly attractive valuations until the situation stabilizes. That said, it may be possible to find bargains in the Hong Kong-listed H-shares market, which is both cheaper and less volatile than the A-shares market. Select banks, property developers and new energy companies could present value. 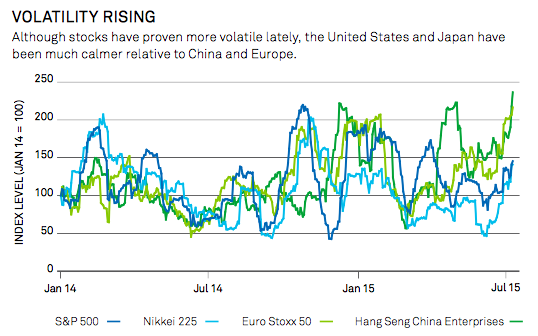 It is worth noting, however, this stock turmoil has not affected the Chinese economy. The PBOC has plenty of spare power to support economic growth and financial markets, unlike some developed market central banks, and will likely continue to implement countermeasures. And when it comes down to it, we have not seen a material impact from the equity selloff on the global economy and markets to date. We elect to downgrade Poland from an overweight to neutral. Poland’s economy is in relatively good shape and profitability is quite strong among Polish companies. However, the financials sector, which represents more than 40% of Poland’s market capitalization, faces the risk of a banking tax and other regulation if a more populist party (the Law and Justice party) comes to power this autumn, as is currently projected. Moreover, Poland no longer stands out as particularly cheap relative to other Eastern European countries, such as Turkey and Russia. It may be time to consider getting back to a benchmark exposure in emerging markets, but investors should remain selective. Consider accessing specific countries or regions, or use an active manager with expertise to identify potential opportunities. We are overweight information technology and financials. As the economy firms, loan demand should rise, which could support financials stocks. Mergers and acquisitions as well as securities underwriting business will likely remain solid, which can also prove helpful. And, technology stocks should benefit from more and more companies deciding to replace antiquated technology infrastructure. We hold a neutral weight to the health care sector. While health care has outperformed by a wide margin this year and is a consensus overweight among money managers, valuations appear reasonable against solid earnings growth and profitability, even for biotechnology stocks. In an environment of decent economic growth, favorable credit conditions and continued good earnings growth, we would anticipate biotech especially, but also life sciences, to outperform. Meanwhile, there are good reasons to consider pharmaceuticals stocks, which tend to have very high dividend payout ratios. This could prove particularly advantageous in a risk-off scenario (defined by a renewed drop in bond yields). We are underweight U.S. utilities and consumer staples. These sectors outperformed during the past month as heightened global risk aversion prompted a decline in interest rates and a preference for defensive sectors. But while defensives may be somewhat less expensive after this year’s repricing, any stabilization from here could entail further downside. We have a neutral exposure to the energy sector as oil prices have declined anew in recent weeks. We prefer integrated oil and gas companies given their more muted sensitivity to oil prices in the past. What is more, their refinery businesses benefit from lower oil prices. We are neutral in industrials. The correction in transportation stocks has investors worried that the decline may be a harbinger of bad news for the broader market. We think the decline in transports has more to do with the subsector’s overvaluation after two years of strong outperformance. Plus, declining global trade volumes, weaker-than-forecast economic activity and reduced demand for coal shipments all play a role in the subsector’s recent outsized move lower. Consider cyclical sectors over defensive and dividend-oriented sectors. Consumer staples and U.S. utilities look particularly unattractive and are vulnerable to rising rates. 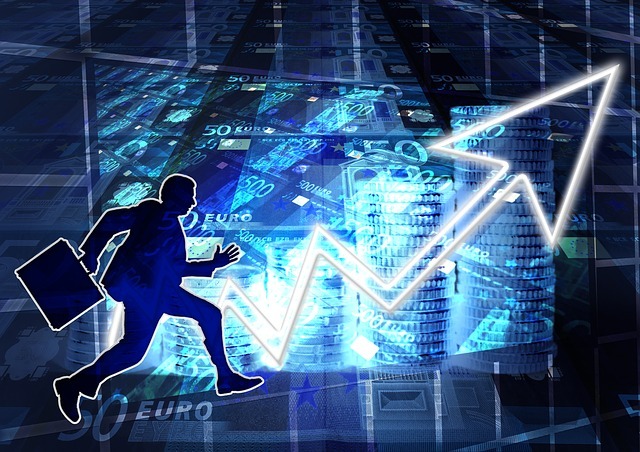 Look into possible opportunities in the technology and financials sectors and consider a long/short approach to potentially benefit from any continued market volatility. We are underweight Treasuries. Yields of long-term debt in the United States, Germany, United Kingdom and Japan hit their highest levels this year in June, but the upward movement was interrupted, at least temporarily, by jitters about Greece and China near month-end. Rate volatility is likely to remain elevated as markets wrestle with the timing of the Fed’s liftoff. We believe yields could climb higher over the course of the year, although much of the adjustment may have already taken place. We hold a neutral position in Treasury Inflation-Protected Securities (TIPS). The backup in yields has returned some value to the asset class. We don’t think inflation will accelerate meaningfully anytime soon, but headline inflation and expectations have inched higher while the risk of disinflation has decreased. We are overweight high yield. Outflows from the asset class continue and spreads are under pressure. Although volatility could persist, yields are attractive in both absolute and relative terms, and fundamentals remain encouraging. We have an overweight in municipals. The municipal market had another negative month in June, though it performed better than the more volatile Treasuries. 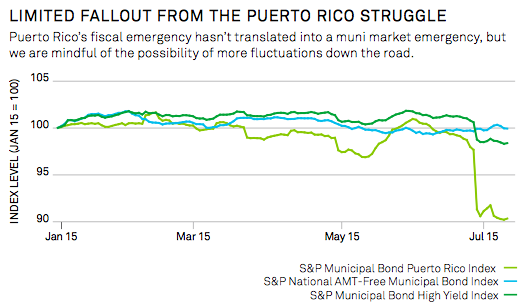 Puerto Rico’s debt woes grabbed headlines but had little price impact thus far on the overall muni market (see the chart below). Fundamentals of the majority of the muni market remain intact, as we anticipate minimal contagion risk. That said, if restructuring negotiations between the commonwealth and its bondholders turn contentious and drag on, this could stoke volatility for the broader market. We are underweight in non-U.S. developed markets and neutral in emerging- market debt. Increased volatility in interest rates and risk assets, as well as the possibility of the dollar resuming its climb, could prove difficult for hard currency- denominated emerging-market debt. We hold a benchmark weight in mortgage-backed securities (MBS). While MBS held up relatively well in the interest rate backup, mortgage spreads relative to Treasuries remain low and valuations do not suggest an attractive entry level yet. With interest rates likely to rise in the United States in 2015, fixed income investors will likely face challenges yet again this year. Consider a flexible strategy with the ability to actively manage duration. Seek to reduce interest rate risk through time by using a diversified bond ladder and matching term maturity to specific investing needs. Cast a wider net for income while carefully balancing the trade-offs between yield and risk. Consider using core bonds for potential diversification benefits and protection from unforeseen shocks to equity markets. 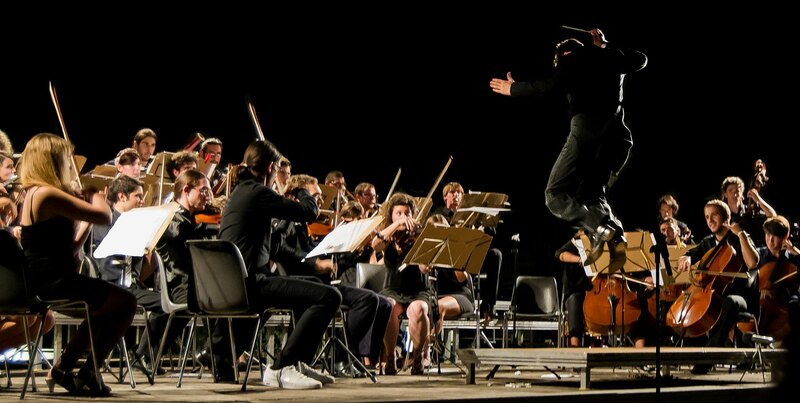 The word symphony is derived from the Greek word symphonia, and before the word settled on its current melodic meaning in the 17th century, it was used to convey compatibility between opinions or actions. 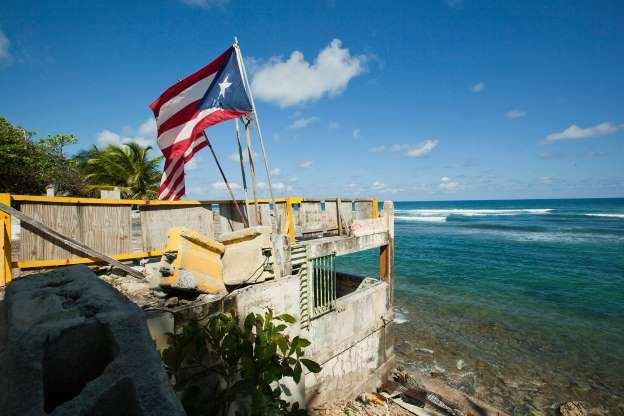 Today, tensions stemming from high debt loads and too little growth—not just in Greece but also China and Puerto Rico—are reaching a crescendo and seem to be some ways off from a resolution. Clashes culminated in early July with the Tsipras administration’s unexpected calling of a referendum and Greek voters’ rejection of European creditor demands. Although a short-term deal was brokered to pull Greece back from the brink of financial collapse, Europe stood its ground on austerity. It is hard to tell how things will play out, but this much is clear: A prolonged period of uncertainty will probably accompany negotiations, as long as a Greek exit from the eurozone is in play. Greece is not the only country beset by uncertainty. Momentum in the high-flying China A-shares market has been broken, though a summer deluge of support measures from the People’s Bank of China (PBOC) ultimately had some stabilizing effects. 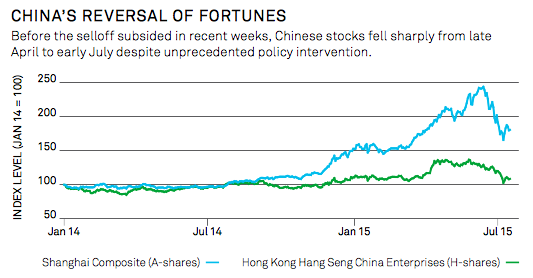 After the latest selloffs, however, China H-shares, which are traded in Hong Kong, appear to offer some relative value. Financial markets at times responded nervously to the Greek and Chinese events, but we think most of the impact will be short-lived. The focus on Greece and China has obscured the facts that the Greek economy is very small, and China A-shares are mostly held by domestic investors. We believe that longer-term damage to the global economy or markets is unlikely. The widespread aversion to risk renewed some appetite for safe haven bonds, as did changing expectations of when the Federal Reserve (Fed) will act on interest rates. Despite that, we still believe stocks will fare better than bonds and are inclined to look internationally and to cyclical sectors for the most compelling equity opportunities. Stocks closed lower by about 1 percent on Tuesday after an unexpected move overnight by the People’s Bank of China to depreciate the yuan by nearly 2 percent. “The major concern is, the prospect of a China hard landing is more ominous as far as its impact on global growth,” said Eric Wiegand, senior portfolio manager at U.S. Bank’s Private Client Reserve. On Monday, the blue-chip index snapped its first seven-day losing streak in four years with a 241-point rise. Biotech stocks and Apple outweighed Google’s 4 percent jump to pressure the Nasdaq Composite off 1.2 percent. Sharp declines in oil pressured the energy sector to give back much of Monday’s gains, dropping nearly 2 percent as one of the greatest decliners in the S&P 500. Renewed concerns about a deeper slowdown in the world’s second-largest economy increased negative sentiment. It’s the “interpretation that the U.S. dollar is going to further strengthen against the Chinese yuan and be a further headwind against U.S. multinationals,” said Mark Luschini, chief investment strategist at Janney Montgomery Scott. “I’m a little surprised (China) did this because they had plenty of room to cut interest rates,” Luschini said. The U.S. dollar index traded mildly higher, while the euro held above $1.10 on a bailout deal between Greece and its creditors. The yen was weaker against the dollar, near 125 yen. European stocks closed sharply lower, with the German DAX off more than 2.5 percent, on the yuan move. Asian stocks ended mostly lower, with the Shanghai Composite flat. “This news is negative for exporters (such as automakers) and luxury goods makers as well as other companies that derive foreign exchange revenue from China and other parts of Asia,” said Ilya Feygin, senior strategist at WallachBeth Capital. He noted that the currency instability benefits Treasurys and gold. Treasury yields fell as traders piled into dollar-denominated assets, with the 10-year yield briefly hitting its lowest level since June 1 before trading near 2.14 percent and the 2-year yield at 0.67 percent. The Treasury Department auctioned $24 billion of 3-year notes at a high yield of 1.013 percent at 1:00 p.m. ET. 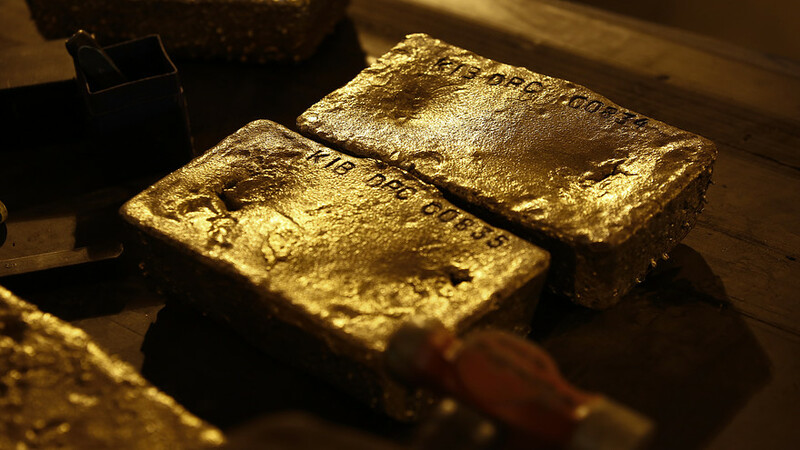 Gold rallied on Monday to its highest level since the end of June. Gold futures traded near $1,110 an ounce in afternoon trade. Investors also watched Google, which unexpectedly announced after the close Monday that it will become part of a new publicly traded entity called Alphabet. Shares will still trade under the tickers GOOGL and GOOG. Class A shares jumped more than 3.5 percent in the afternoon. Oil extended a recent decline. Brent crude was down more than 2.5 percent to below $49 a barrel, while U.S. crude briefly fell below $43 a barrel for the first time since March. Crude oil futures hit a five-month intraday low of $42.69 and settled down $1.88, or 4.18 percent, at $43.08 a barrel, a six-year low. Gold futures ended up $3.60 at $1,107.70 an ounce. On the data front, preliminary second quarter productivity was up at an annual rate of 1.3 percent, while unit labor costs were up 0.5 percent. Wholesale sales rose 0.1 percent in June, the weakest since March of this year, while inventories topped expectations with a gain of 0.9 percent. May’s figure was revised lower to 0.6 percent from 0.8 percent. “I think once investors get past the yuan devaluation we can focus on the (U.S.) economic picture, which remains good,” Luschini said. Most analysts expect the Federal Reserve will find enough support from economic data to raise rates as early as September. Before the opening bell, Towers Watson posted quarterly results that beat expectations on both the top and bottom line. In other earnings news, Shake Shack posted results after the close Monday that beat on both the top and bottom line. The restaurant chain also raised its full-year guidance. Kraft Heinz reported a decline in sales at both its Kraft and Heinz divisions. Combined results for the recently merged firm were not reported. Computer Sciences, Symantec, Cree and Cyber Ark Software will report after the bell. The CBOE Volatility Index (VIX), widely considered the best gauge of fear in the market, traded above 14. 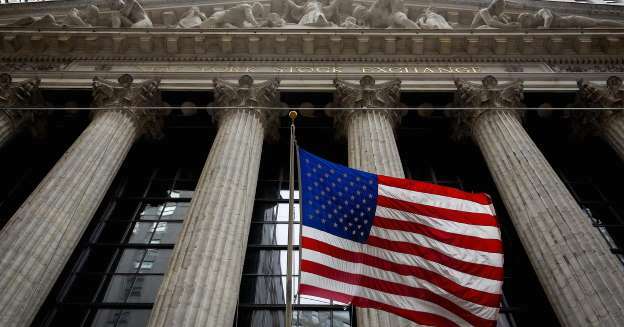 About seven stocks declined for every three advancers on the New York Stock Exchange, with an exchange volume of 505 million and a composite volume of nearly 2.5 billion in afternoon trade. It’s approaching that time of year when market activity typically slows, as traders and central bankers alike depart for long holidays. But this summer is shaping up to be anything but quiet for markets, with Greece at a cross roads, stocks in China nose diving and rising uncertainty about the timing of a U.S. interest rate rise. “Summers are always difficult in the markets, but every summer turns out to be interesting and there’s so much going on this summer,” Bill Blain, a strategist at Mint Partners in London, told CNBC on Friday. While the crisis in Greece, which holds a referendum this Sunday on whether or not to accept creditor-proposed bailout terms, is likely to be the trigger for near-term volatility, markets have much bigger fish to fry in the weeks to ahead. Take for instance the slide in Chinese stock markets, which is fuelling concerns about the outlook for the world’s second biggest economy. The benchmark Shanghai Composite index, which had risen as much as 113 percent between November and a peak in June, has collapsed, sliding almost 30 percent. “It’s not Greece but China we should be concerned about,” said Blain. “The correction that we’re seeing in stocks is fascinating and the fact that the authorities are clearly nervous should make markets nervous,” he said, referring to measures taken this week by Beijing to shore up the battered equity market. Analysts said uncertainty about the timing of a rise in U.S. interest rates was another key reason to keep traders on edge over the summer months, with Thursday’s softer-than-expected June jobs data prompting a re-think on the rate outlook. “I think the biggest risk is not so much Greece; not so much China (stocks), which is in a dramatic move but is pretty localised, I think it is the Fed and the U.S. economy,” Giles Keating, the global head of research for private banking and wealth management at Credit Suisse, told CNBC’s “Squawk Box Europe” on Friday. The timing of the Fed’s first rate hike since 2006 and the pace of subsequent monetary tightening is viewed as one of the biggest risks to global markets – from emerging markets, which are seen among the most vulnerable to a rise in risk aversion, to bond markets, which have already seen heavy selling. Slim Feriani, CEO of MENA Capital, said that while Greece was a concern, Fed policy was a bigger worry for markets. “The bigger cloud hanging over markets in general in the next 6-12 months is the Fed and what they do and when,” he said from a fund forum in Monaco earlier this week. The tech-heavy Nasdaq (.IXIC) hit a record high in June, while the broader S&P 500 (.SPX) closed at about 2,077 points on Thursday – about 2.5 percent off a record high hit in May. 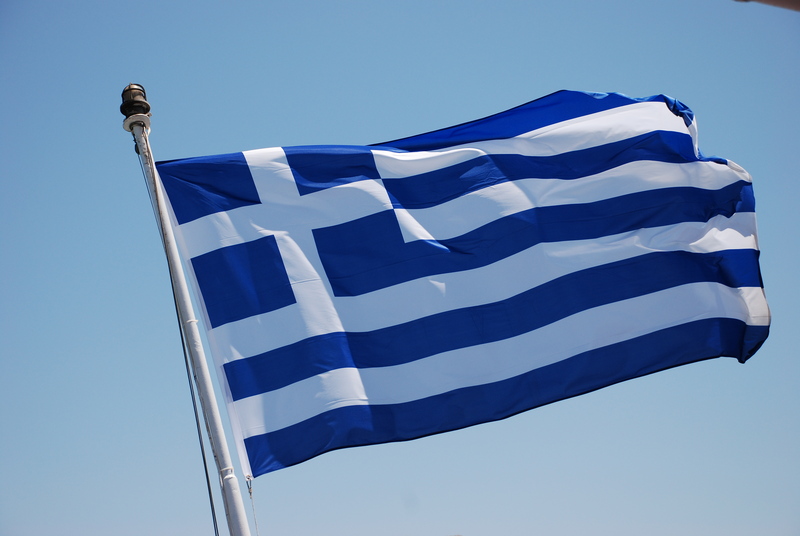 Uncertainty surrounding Greece meanwhile is unlikely to go away, with Sunday’s shock referendum suggesting the country will remain a source of market volatility in the weeks ahead, analysts said. Greece this week became the first advanced economy to default on a loan from the International Monetary Fund and its worsening financial crisis has fuelled fears that it will become the first country to leave the euro zone. If Greek voters back the creditors’ bailout plan—which the anti-austerity government has recommended they reject—Greek Prime Minister Alexis Tsipras has made it clear he will quit. “There is a view that we’re going to get this referendum result on Monday morning and that will explain everything,” Blain said. European policy makers raised pressure on Greece to return to the negotiating table and make further concessions to unlock aid, as each side laid out its demands to rally support for its respective position. Stocks and the euro fell on Monday as the extent of the policy divide that remains to be resolved was laid bare after weekend talks billed by European officials as a last attempt to end the standoff broke up early. With signs that negotiating fatigue was stoking intransigence on all sides, some euro-area officials publicly raised the prospect of Greece’s exit from the currency region as the Greek government suggested it had reached the limits of its ability to make concessions. Finance Ministry officials from the 19-nation euro zone are due to hold a Greece call on Tuesday ahead of a meeting of ministers later this week. “We’re reaching a potential period of turbulence if no accord is found,” French President Francois Hollande told reporters in Paris on Monday. 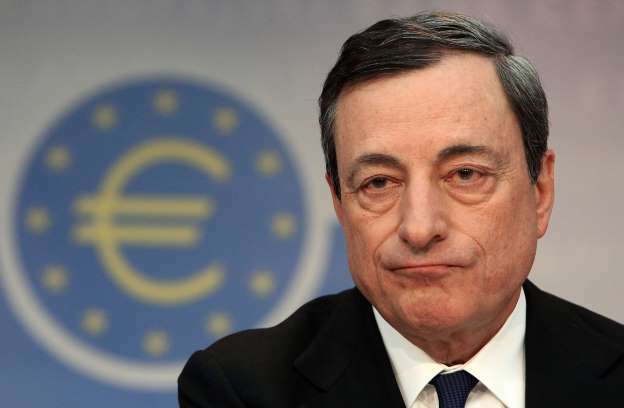 “This is a message for Greece, because Greece mustn’t wait, it must renew talks with the institutions,” he said, referring to the International Monetary Fund, the ECB and the European Commission. Greek Prime Minister Alexis Tsipras’s government said that it was awaiting an invitation from its creditors and is ready to respond anytime to continue the negotiations, according to an e- mail from the premier’s office. The EU commission and IMF separately outlined their respective goals in the talks that broke up after just 45 minutes on Sunday. The focus now shifts to a June 18 meeting of euro-area finance ministers in Luxembourg. Officials have focused on that as a make-or-break session for Greece’s ability to avert default and stay in the currency union. Tsipras, in a statement on Monday, portrayed Greece as the torchbearer of democracy, standing firm against creditors’ demand for pension cuts. That prompted a rebuke from the European Commission. “It is a gross misrepresentation of facts to say the institutions are calling or have called for cuts in individual pensions,” spokeswoman Annika Breidthardt told reporters in Brussels.